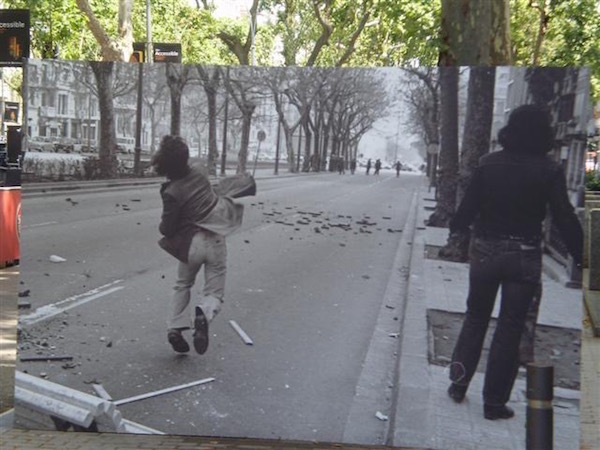 The streets of Barcelona have seen fierce battles over issues such as workers’ rights, the pernicious, all-pervasive influence of the Church, education, Republicanism, a Stalinist coup, representative democracy, independence, workers’ self-management, property speculation, squatters’ rights, forced evictions and revolution. The city’s layout has been largely informed by the tactical manoeuvre needs of the army. For example, Via Laietana, was in part created to allow cavalry units to disperse hostile crowds forming outside the inner city walls. Avinguda Diagonal was created, in part, to enable rapid access to the heart of the city by troops based in barracks in Pedralbes. Parc Ciutadella was once the site of an enormous miltary citadel. The castle on Montjuïc, was only handed to the city in 2008; until 1963 it was a prison run by the military to incarcerate and sometimes execute, dissidents. In February, 1976, three months after the death of the dictator, Generalísimo Francisco Franco, the Assembly of Catalunya (Asemblea de Catalunya) called a demonstration in Barcelona. 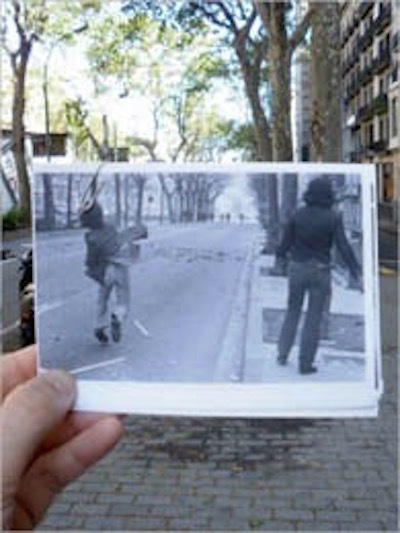 The above photo was taken from the protestors’ point of view on Gran de Gràcia (Els Jardinets de Salvador Espriu), looking toward a detachment of retreating Grises at Cinco d’Oros (the junction of Passeig de Gràcia, Avinguda Diagonal and Carrer de Córsega). The photo above situates the event in Els Jardinets today. It is sobering to have in mind that according to new laws passed by the current government of Spain, such photographs as used above, if taken today, would be deemed illegal. Both the photographer, and I, the website owner, could each be liable for a fine of up to 600,000€. You’ll find Els Jardinets [Jardines de Salvador Espriu] just above the junction of Avinguda Diagonal/Passeig de Gràcia/Carrer Còrsega. The junction is officially called Plaça de Joan Carlos I, though I have never heard anyone refer to it as such. If you want to visit the site, it’s really straightforward — just stroll to the end of Passeig de Gràcia and cross the busy junction. Nearest metro: Diagonal, L3 – Green and L5 – Blue. Visiting Barcelona? What you need know about the T-10 in Barcelona.